Sapsuckers will feed on over 250 species of hardwoods and conifers. Sapsucker damage is easy to identify. The holes are approximately 1/4 inch in diameter and are drilled in horizontal and vertical rows. There are usually many holes close together. This is often mistaken for insect damage (e.g., bark beetles or other boring insects). Insect damage will typically have fewer, smaller holes, and the holes will be randomly distributed, not in rows like sapsucker holes. Insect holes may also have some boring dust in or on the ground under them, whereas sapsucker holes will not. The presence of sapsucker damage does not necessarily mean the tree has an insect infestation. 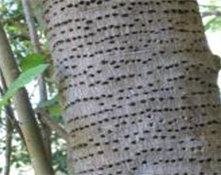 Unlike other woodpeckers, sapsuckers are actually drilling for the tree sap, not for insects living in the tree. 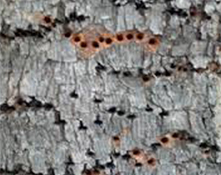 Although insects make up part of its diet, the sapsucker is better known for its boring of numerous holes in the bark of live trees to obtain sap, the activity from which it derives its name. The Yellow-bellied Sapsucker is a member of the woodpecker family. A persistent Yellow-bellied Sapsucker may choose to feed repeatedly on a given tree, which can cause damage that is more extensive and leaves the tree vulnerable to other problems, such as insects or decay fungi. Early in the spring the sapsucker tests many trees around its selected nesting site by making sample drillings before selecting ones it prefers. These trees, because of quantity or sugar content of the sap, are visited several times a day for the rest of the season and sometimes are used as a food source for several years. Sapsuckers, like all woodpeckers, are protected by the Federal Migratory Bird Treaty Act, so a permit is required for lethal control. For the most part, sapsucker damage is part of living with nature, something to be tolerated as an occasional inconvenience or even enjoyed as part of natural wildlife activity. The most commonly recommended damage control method is to wrap burlap around the affected area to discourage sapsuckers from returning. Liquid spray repellents applied to the tree bark can also be used as well as hanging bright, shiny objects such as pie tins, streamers, or beach balls on the tree as scare devices. These techniques may or may not be effective, and they may just shift the bird’s focus to another part of the tree or to a neighboring tree. 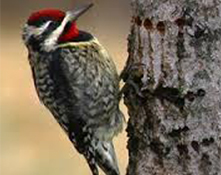 If the sapsucker appears to favor a specific tree, it may be best to use it as a sacrifice tree, so the bird leaves other trees alone in favor of its preferred feeding spot.